I will professionally dispute all derogatory items that are listed on your credit reports which consist of Collections, Charge-Offs, Late Payments, Judgments, Debt Validations, Medical Collections, and Inquires. I will send letters to each of the (3) Credit Bureaus; Experian, Equifax and Transunion disputing the negative items listed and/or the Collection Agency and make them validate the debt or debts that are in question. I will also do this for ChexSystems if you have ordered this additional service. This process begins immediately after you have signed up and submitted all required documents and payment. I will provide you with education, guides and tips to help you be successful not just through the repair process but for ever.  The CreditDiva repair process is not a quick fix, this is a lifestyle change that will serve you well for the rest of your life. Follow our facebook page and sign up for newsletter for tips and information on managing money and credit. If indicated, you are responsible for applying for your 3-4 secured card/cards to rebuild your credit within 45 days after signing up for the program. Secured cards include Conns, Capital One, Credit One Bank, First Premier, Discover, Fingerhut and Merrick Bank. You are responsible for paying down the balances on your positive open revolving trade lines to aid in increasing their credit scores keeping them under 30% credit utilization. You must sign up with a Credit Monitoring Company to be alerted of any changes to your credit scores and accounts during this process within 45 of signing up for the program. You must receive alerts and score monitoring at minimum of every 30 days. You must send me your updated reports and scores monthly. 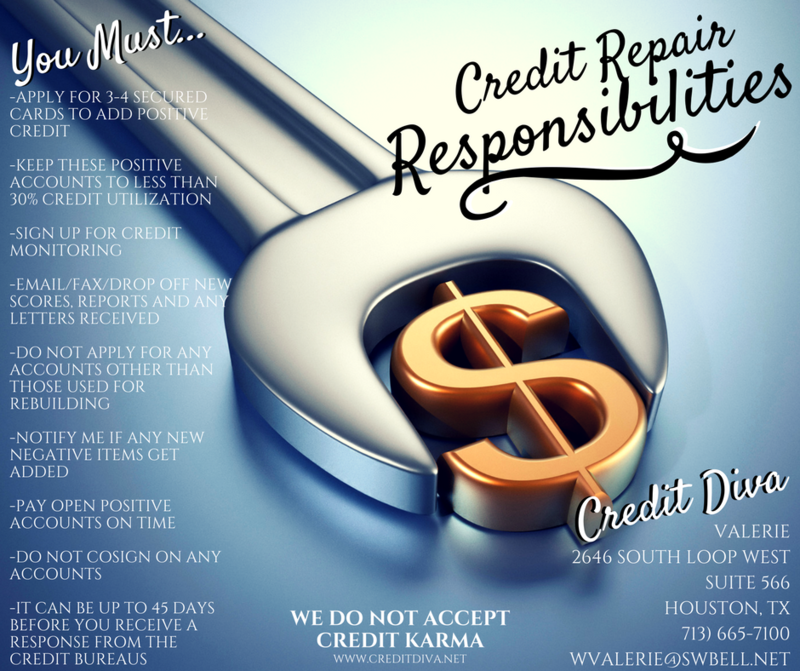 WE DO NOT ACCEPT CREDIT KARMA. You must fax/email/mail/drop off any and all letters that are received in the mail from the Credit Bureaus and the Collection Agencies as they are received so that we may process them and respond if necessary. You must not apply for or acquire any OTHER ADDITIONAL INQUIRES DURING THIS PROCESS EXCEPT FOR YOUR SECURED CARD/CARDS. You must notify me promptly if a new negative item has been added to your credit report so that I can begin to work on it. It is your obligation to adhere to the responsibilities assigned to you above. If you have been inactive for 60 days or more you will need to pay a fee of $145 to be reinstated to the program. your service fee. No portion will be refunded to you.